Are you in need of space and need a great portable pitcher filter? 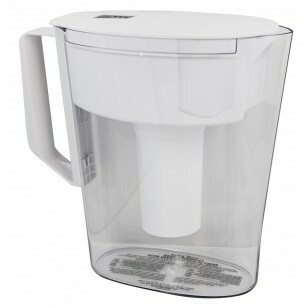 If you answered yes the Brita-Soho water pitcher is exactly what you need. The small compact pitcher will fit in a small college dorm room or an apartment. This BPA free product filters out a variety of contaminants primarily found in city water such as chlorine taste, odor, copper cadmium, and mercury. In addition to doing a great job filtering out contaminates, the locking lid will ensure no spills or leakage occurs. The five cup capacity will allow you to refill less frequently. If you have trouble remembering when to replace the filter, the filter indicator light will let you know when a change is needed. Make sure to order yours today!